BAM | North Canton, Ohio | dreaming of the next bite. If you think a typical menu in the midwest consists of meat-and-potatoes, fried foods, and homestyle cookin’, you’re sort of right. But luckily there are some exceptions like BAM Healthy Cuisine in North Canton. BAM is one of the only restaurants of its kind in this area – a locally owned, made-to-order, all things fresh, often organic, health food cafe. BAM is so non-descript from the street that you might not even realize its a restaurant. Inside is a small dining room with some tables and chairs, and a few bar stools at a counter. There are also a few coolers with drinks and pre-made to-go items. Once at the register to place your order, you can see the whole inside of the kitchen, where everything is made fresh. The sheer quantity of menu items is pretty remarkable, considering the size of the place. The menu consists of wraps, sandwiches, grill items, salads, smoothie shakes, and even some flour-less “treats” like the popular Power-bomb (a ball of goodness, loaded with oats, nuts, dark chocolate….no flour, white sugar, or artificial sweeteners). My experience has mostly been with the wraps, but I’ve also tried the grilled BBQ chicken breast with honey-raisin rice. BAM is so fun because you can try something different every time you go. They have an excellent range of ingredients, all sharing the same theme of being fresh, healthy, and made-to-order. Most sauces are homemade too. With that said, be prepared to wait a little, because it does take time, especially if you’re going with a group or if there’s a line when you arrive. The kitchen is small, and while it is for the most part fast food in terms of the ordering format, this is definitely not a fast food restaurant. I only say this to manage expectations – do not go when you’re in a hurry! The thing about BAM: don’t go into this expecting a little “dash” of healthy. Instead be prepared for a big blast of healthy. They use lots of veggies in everything, and you won’t find a ton of butter, mayo, or any other indulgent and fattening favorite. 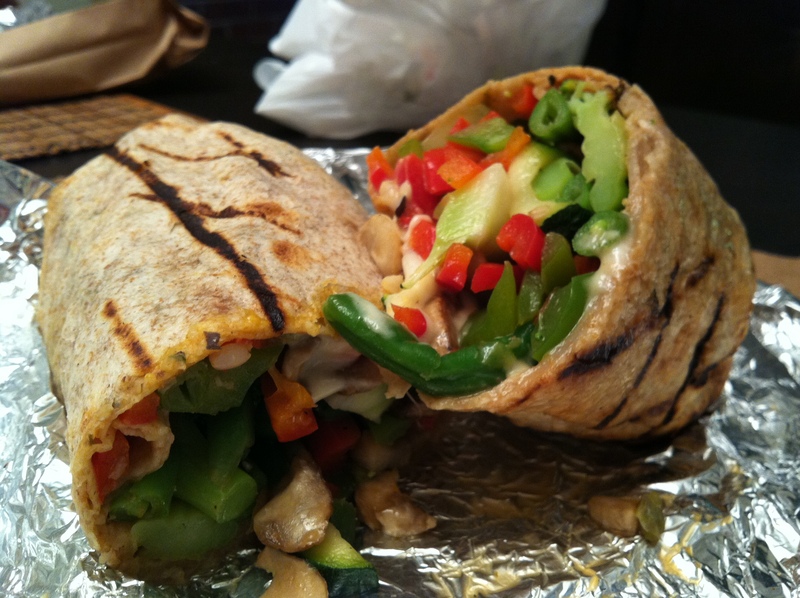 Here’s an even better example (pictured below) – the veggie wrap. (As if I needed to clarify, I did not order this. If it’s going to be ultra-healthy it better at least have meat.) So BAM really seems to be catching on – it’s usually crawling with young, healthy, and/or hip looking people, or at least other healthy “pretenders” like me. 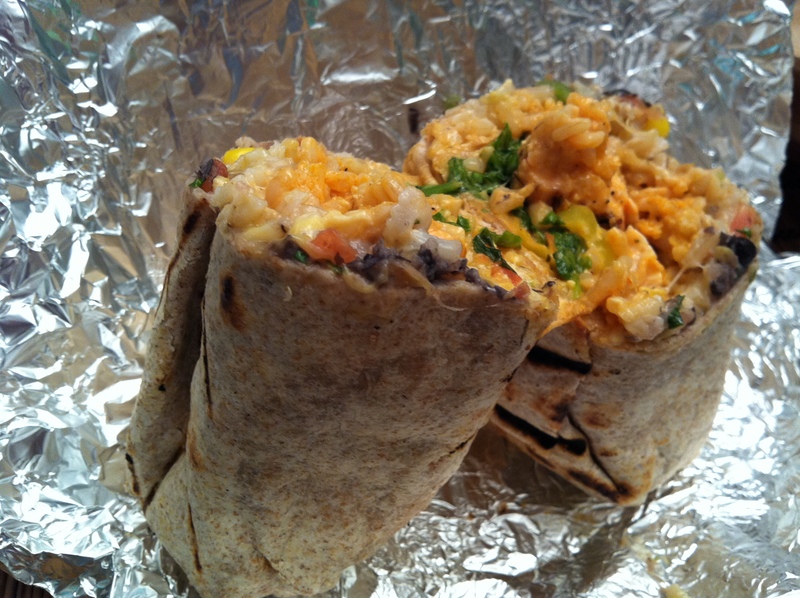 Bottom line: BAM is a must try. This entry was posted in Canton, OH and tagged healthy, one-and-only, salad, smoothie by Yvette (@foodiedreamer). Bookmark the permalink. B.A.M. is definitely a must try. I love this place. They go out of their way to make the food just how you want it. Everything is super fresh, and delicious! It’s a good idea to call ahead, but if you forget, it’s worth waiting for. My favorites are the veggie wrap and the black bean brownie sundae..YUM.